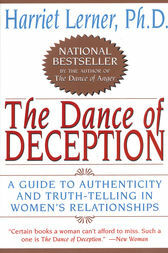 When The Dance of Deceptionwas published, Lerner discovered that women were not eager to identify with the subject. "Well, I don't do deception" was a common resonse. We all "do deception", often with the intention to protect ourselves and the relationships we depend on. The Dance of Deceptionunravels the ways (and whys) that women show the false and hide the real -- even to our own selves. We see how relationships are affected by lying and faking, by silence and pretending and by brave -- but misguided -- efforts to tell the truth. Truth-telling is at the heart of what is most central in women's lives. It is at the foundation of authenticity and creativity, intimacy and joy. Yet in the name of "honesty", we can bludgeon each other. We can approach a difficult issue with such a poor sense of timing and tact that we can actually shut down the lines of communication rather than widening the path of truth-telling. Sometimes Lerner's advice takes a surprising turn -- for example, when she asks us to engage in a bold act of pretending in order to discover something "more real"; or when she tells us not to parachute down on our family to bring up a "hot issue" without laying the necessary groundwork first. Whether the subject is affairs, family secrets, sexual faking or the challenge of "being oneself", Lerner helps us to discover, speak and live our own truths.